More gaming goodness from Witching Hour. If you're a fan of medieval war games, chances are you've already checked out Ravenmark: Scourge of Estellion, Witching Hour Studios' turn-based opus that arrived for iOS devices a couple of years ago. With tactical depth and an innovative simultaneous turn system, it attracted a huge fan base - and they're about to be rewarded with a new chapter. The team will release the second game in the series, Ravenmark: Mercenaries, for iOS this week. It'll feature all the complex action of the original, along with the addition of multiplayer options, as well as the ability to upgrade your brigades however you see fit. To prepare you for the forthcoming release, Witching Hour Studios delivered 13 minutes of gameplay footage from the follow-up, which walks you through the opening steps of a battle and gets you used to the tactics. Part of the video also focuses on multiplayer. It features commentary from the developer as well, in case you're looking for behind-the-scenes insight. 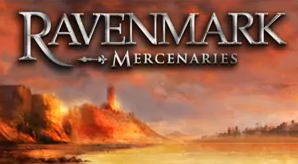 Ravenmark: Mercenaries will release on July 11 for iOS devices.